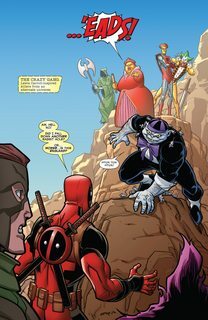 Deadpool & The Mercs For Money Vol. 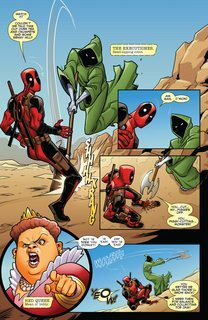 1 #1 – 5 (2016) : If Deadpool is all busy Avengin’ and Assemblin’, who’s picking up the slack and taking care of mercenary business? How about his own crack team, the legally cleared-to-be-called Mercs for Money! Got a problem you can’t solve on your own and a pile of money you’d like to be rid of? 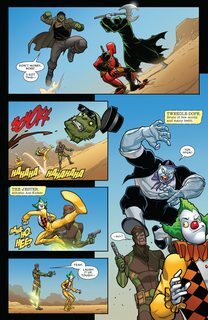 Just call Deadpool, Stingray, Solo, Foolkiller, Terror and Slapstick – and watch as that problem is shot, stabbed, eviscerated, pulverized and generally made bloody! Then there’s the new guy, Masacre, the Deadpool of Mexico – whose Spanish-language debut has been poorly translated into English! But whatever their native tongue, the language of violence is universal, and these massed Mercs will make themselves heard against a boatload of villains, a demonic trucker and anyone else who gets in their way!